U.S. Marine Corps Cpl. Jason Sellars participated in Sun Valley Adaptive Sports’ Higher Ground veterans rehabilitation program last year. This weekend, he will be giving back to the community that has helped him work through traumas suffered while on active military duty for four years in Iraq. Sellars is a disabled veteran from Tennessee who suffers from post-traumatic stress disorder and traumatic brain injuries after two tours in Iraq. This weekend, he will lead a “sensory trail” building project at the Swiftsure Ranch, about half a mile south of Bellevue on state Highway 75. The site is the headquarters of the Swiftsure Ranch Therapeutic Equestrian Center. 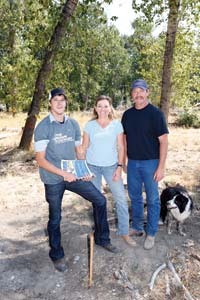 Sellars will welcome volunteers of all kinds, including veterans, to the Swiftsure Ranch from 8 a.m. to 5 p.m. Saturday, Sept. 22, for trail clearing and construction. Registration for raffle prizes, which include a river trip, will begin at 8:30 a.m. Breakfast and lunch will be provided. A sensory trail is a horse-riding trail with various types of sensory stimulation intended to benefit people with autism, developmental disabilities and visual impairments. The trail will feature chimes, fruit smells and puzzles and games that can be enjoyed by disabled horse riders. Sellars serves as veteran liaison for Higher Ground, a local program aimed at gathering veterans together for outdoor, therapeutic activities. He is also a Bravo Class Fellow of The Mission Continues veterans program, aimed at engaging veterans in community activities and service projects. The Mission Continues fellows participate in many events, including crayfish boils in Texas and half-marathons in New York. They also give back to communities such as the Wood River Valley. “I chose to dedicate at least six months of my life in service to my fellow veterans because I was inspired by the work being done at The Mission Continues and as a past participant of Higher Ground,” Sellars said. For more information about volunteering, call Swiftsure Ranch at 578-9111. For more information about the project, call Sellars at (615) 594-6300.